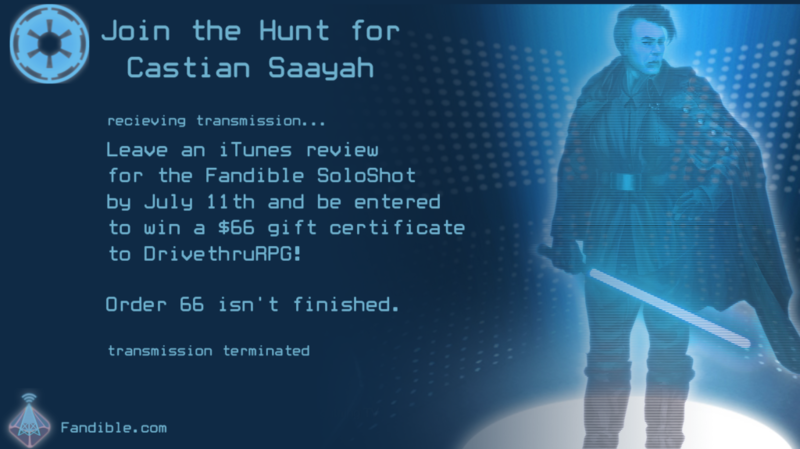 Join the Hunt for Castian Saayah - and win a Drive Thru RPG gift certificate! If you’ve already left a review, you’re eligible to enter too! Just take a screenshot of your already-listed review and send it in to us. All reviews received before July 11th will be entered into a drawing to win a gift certificate to Drive Thru RPG for $66. Reviews, as you know, help others find our podcast – which will ultimately help the Empire track down the traitorous Castian Saayah. Join the hunt now!